Often referred to as the "cream of the punk rock crop," Northern California's streetpunk/oi kings Harrington Saints bring you the newest sounds of the street, "Upright Citizen" backed with "Let's Go Rob A Bank." Delivering their usual bombastic sound, this new single continues the tradition of hard driving music coupled with memorable, singalong hooks. 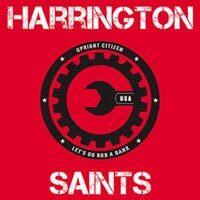 Harrington Saints prove once again, and deservingly so, why they are the gold standard of punk rock.